There is a point of view saying that maintaining the first and the leading place is harder than attaining it and since Baghdad University has gained significant global eligibilities in many world rankings with its own competency and ability, so it was able to its maintain progress and superiority to other Iraqi and Arab universities in “webometrics” ranking web of universities issued in Spain, to be the only top Iraqi university for the sixth time that is something that confirms that university of Baghdad is going on according to sober scientific approach that resulted in achieving success and excellence. President of university of Baghdad during a meeting with the website team stated that the university by its own capabilities and without relying on foreign experience is working on devoting the concept of scientific authenticity in terms of its capacity to keep pace with world evolution, also he stressed that the university seeks superiority and development that serve the nation and the university so that it would be prestigious among other global universities and that the Iraqi mind proved to the world its capacity and potential to compete at the international as well as the local levels, which turned out Baghdad University exceled at many European, Arab and some American universities which is something that motivated us to do better and pace our efforts towards that goal. The university channel and website teams accompanied this meeting and documented it with a series of videos and photos. In the occasion of the 50th anniversary of “World Cancer Day”, on the 4th of February of every year the pioneering national center for cancer research at university of Baghdad in cooperation with research and development department in coordination with World Health Organization, the medical city department and center for genetic research on cancer in Switzerland held a specialized scientific symposium under the slogan (we can .. I can) at the conference hall at the center on Thursday, 4th February 2016. About 140 members participated in this symposium, representing distinguished deans and professors at the faculties of medicine, medical group and consultants working in the field of cancer from the ministries of higher education and health at the provincial level, headed by deputy minister of higher education for scientific research affairs, Mr. advisor of minister of health, director of World Health Organization in Iraq, scientific assistant of Baghdad university president, Director General of the department of the city of medicine, Director General of the department of public health at the ministry of health, deans of Al-Kindy college of medicine, college of dentistry at Iraqi University, college of nursing at Baghdad university, college of nursing at Babylon and the Technical Institute. The symposium was chaired by prof. Dr. Nada Abdul Saheb al-Alwan, director of the pioneering national center for cancer research and the executive director of the national campaign for early detection of cancer and started with opening words and welcome where Deputy Chief of the ministry of higher education and scientific research, prof. Fouad Qassim gave his acknowledgements for the efforts exerted by the center towards the implementation of a plan aimed at achieving the advancement of cancer control, outputs and medical research that would contribute effectively in supporting the development of scientific pillars within the ministry in particular and Iraq in general. Dr. Osamah Fadel, scientific assistant to the presidency of the university and Dr. Abdul Amir Mukhtar, counselor of the ministry of health, Dr. Hassan al-Tamimi, Director General of the department of medicine city welcomed this event and shed light on the support made by the responsible authorities at these ministries for the promotion of scientific performance and services to take care of cancer patients. The director of World Health Organization, Dr. Altaf Musani, focused in his speech on the goals of the organization aimed at cooperation with concerned ministries to raise awareness of cancer and how to fight it by providing the torrent early detection and protection so that to ensure adequate treatment, noting the important role of civil society organizations and the Iraqi individual in this area. D. Nada al-Alwan delivered the main lecture entitled “building a national strategy to combat cancer in Iraq in accordance with the methodology of World Health Organization in which she reviewed the burden of cancer and deaths in the world in general and in the Middle East and Iraq in particular, international methods of control, prevention and early detection, treatment and palliative care, promoting relevant studies and research, also she addressed the database system developed for breast cancer control in Iraq and that was mainly to establish “a regional project for research on cancer in the Middle East” in which 8 Arab countries participated in headed by the National Center for cancer at the Iraqi ministry of higher education and under direct supervision of the World Health Organization and international agency for research on cancer in France that included influential of cancer women survivors where they expressed their suffering when undergoing therapy strongly with the faith of Allah. During the symposium, videos were presented, especially in the World Cancer Day, also leaflets and brochures were distributed. The symposium opened the doors of research cooperation with the genetic center for cancer research in Switzerland with the representative of Omega office, Dr. Haidar Mustafa where he spoke about the services related to diagnosis and treatment provided by the center and during the second half of the symposium, an online communication with specialists of the center in Switzerland took place to discuss ways to promote scientific exchange and research. Prof. Dr. Nada al-Alwan concluded the symposium with an appeal, in solidarity with the World Health Organization, to all the ministries concerned to provide necessary health services for patients with cancer, a second appeal to civil society organizations and the media to perform their effective to enhance public awareness about this disease and ways to combat it, a third appeal to the Iraqi society and the individual to act on the commitment to prevention of disease by quitting the harmful habits such as smoking, interest in physical activity and through eating healthy food. Important recommendations were reached at, notably close cooperation between the ministries of higher education and health, World Health Organization to unify efforts to fight this disease. 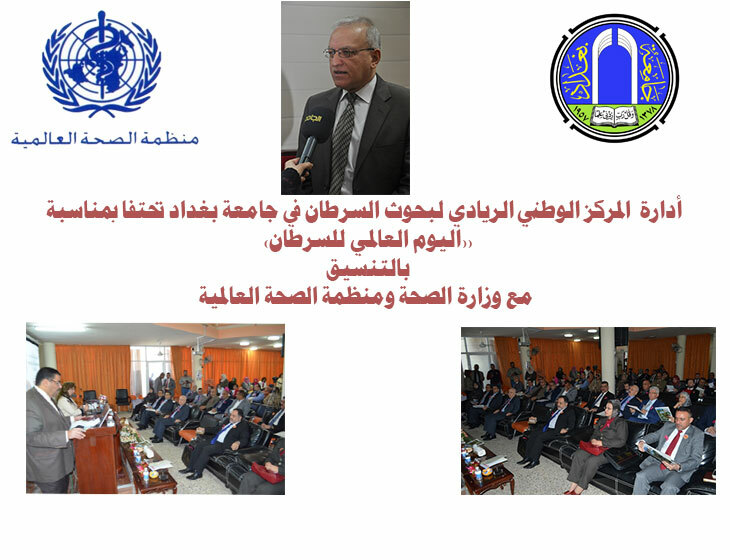 Moreover the director of the World Health Organization in Iraq promised to allocate part of the budget for the rehabilitation of the specialist staffs at these ministries and cooperation with the center and the specialized bodies at the ministry of health to produce tutorial movie designed to educate the community on methods of prevention and early detection of cancer to be displayed periodically on Iraqi satellite channels. With the great developments happening in digital media and global networks with an abundance of film material on social networking sites including YouTube videos, there is a need to find new outlets for the university in this aspect based on a scientific perspective and since that the university seeks to keep pace with further technological developments, it has established a large website, with millions of images, pages, texts, scientific journals and other important academic documentary data and it established a TV channel to publish more videos with the support and encouragement of president of Baghdad University, prof. Dr. Alaa Abdul Hussein who stressed on global communications technology in this regard, and after further meetings with the director of the committee of media, a video library was established at the university channel office with the direct supervision of the university rector to be a vivid memory to give the opportunity to students, members and professors to access to these documents so that this digital library has launched via the finest efforts of the members of the university’s channel office website on this URL: Baghdad University channel. 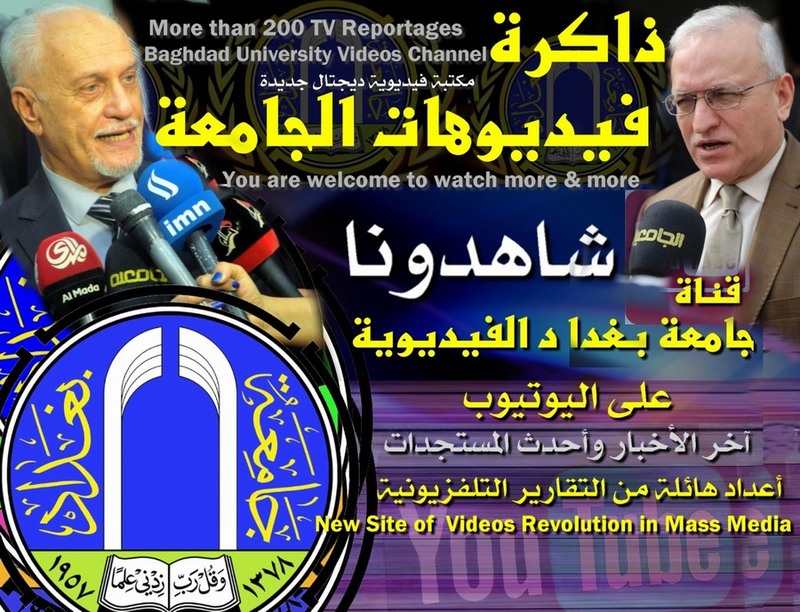 Director of the university channel, prof. Dr. Abdul Basit Salman stated that this digital library contains “High Definition” videos and photos that represented an archive of the scientific and the academic heritage and achievements of the university as the first step towards establishing an academic library added to the library of the secretariat of the central library of our university in near future and that the project will go forward for documenting thousands of videos and this requires great infrastructure for space and size of the transmitters and receivers so that to raise the material accuracy according to a very high purity since the rector directed not to compress videos. 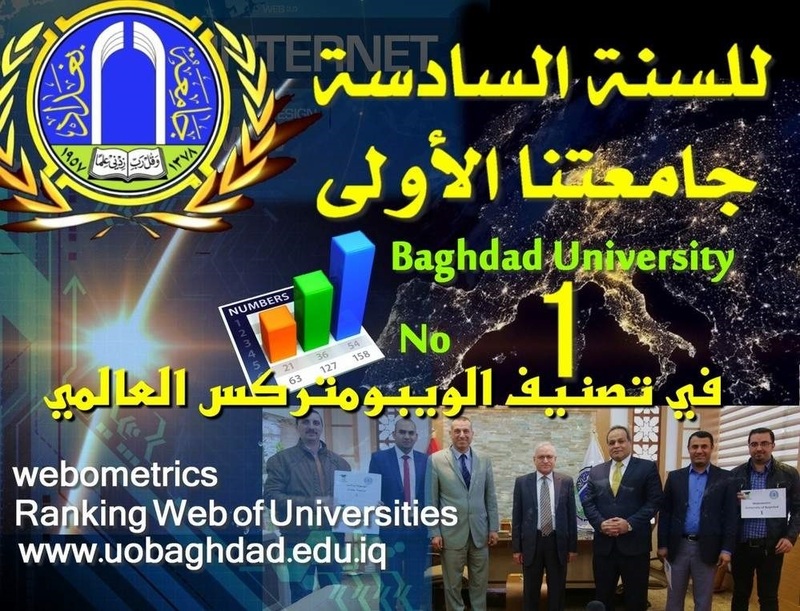 Director of the university website, teacher Basim Hamid stated that the university is going on according to a systematic strategy especially after it outperformed for sixth year other Iraqi universities and most universities in the Middle East in global rankings. 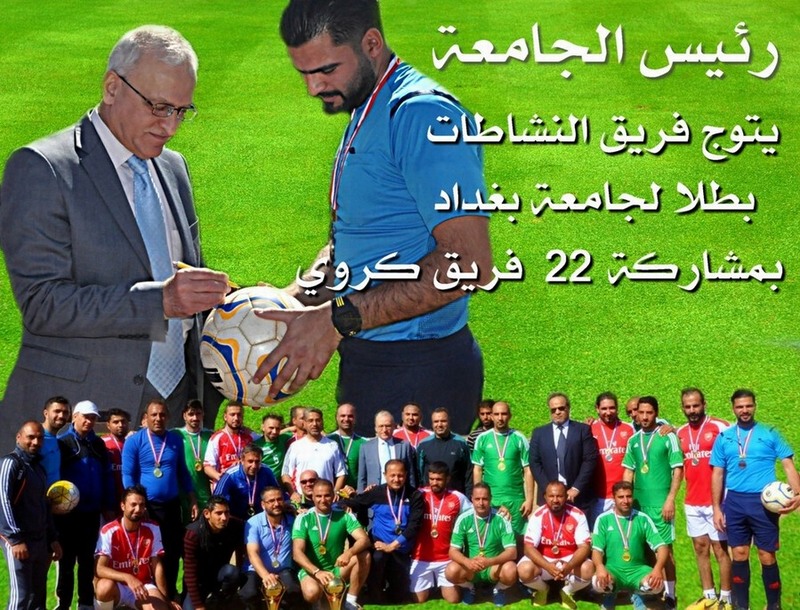 In an encouraging, enthusiastic and energetic atmosphere, the president of Baghdad university concluded the football championship with the winning of the team of sports and artistic activities department at Jadiriya stadium with the presence of the director of sports and artistic activities department, Dr. Mohammed Al-Rubaie and a large number of fans and those interested, with a professional football arbitration crew along with the supervision of prof. Dr. Ali Yusuf, a professor of games at the college of physical education who attended the course of the final game. Prof. Dr. Alaa abdul Hussein stated to the university website and university TV channel team that sports is considered as an essential basis in the development of capabilities among members of the university and it has an important role in improving body and mind since the healthy mind is found in the healthy body, so we attach great interest in sports for males and females students and members. It is worth mentioned that the university holds such competitions from time to time to improve performance, vitality and perseverance. The university website team and university channel office accompanied the course of the game and documented this event with a set of photos and video scenes.